In case you didn’t know, I am a huge fan of bacon. Plain bacon, bacon with eggs, bacon in kale salad, bacon on burgers, bacon on bacon…basically, I love bacon any and every way it can be served. 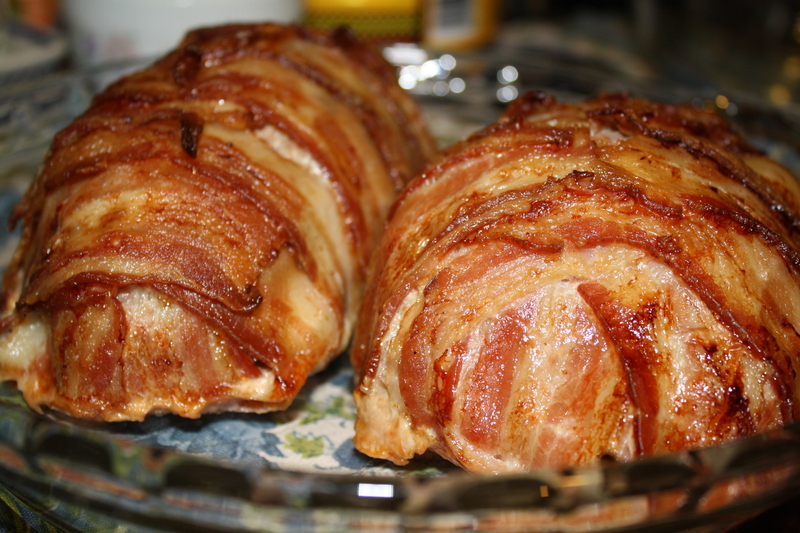 So naturally, when I saw a recipe for a bacon wrapped meat log on Jen’s Gone Paleo, I knew I had to try it. I decided to make mine a meatloaf rather than a meat log, and I used ground turkey instead of beef, simply because it was the ground meat hanging out in my freezer. 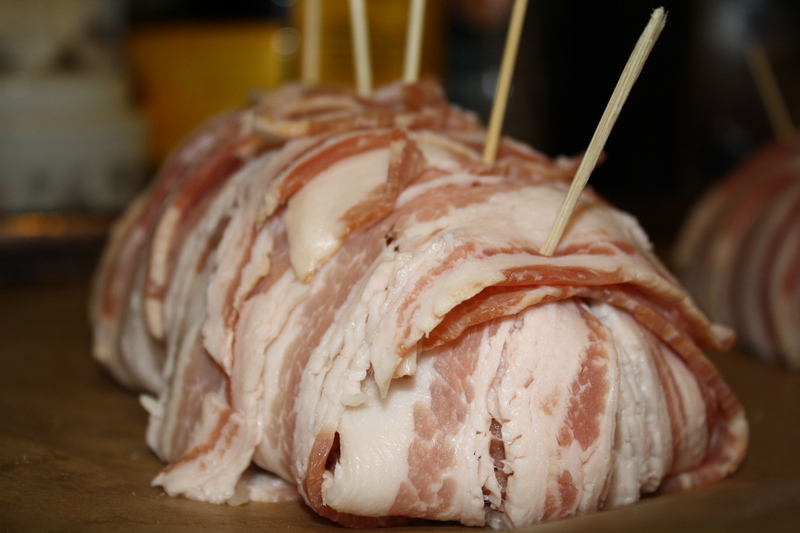 Bacon– 6 to 8 strips. 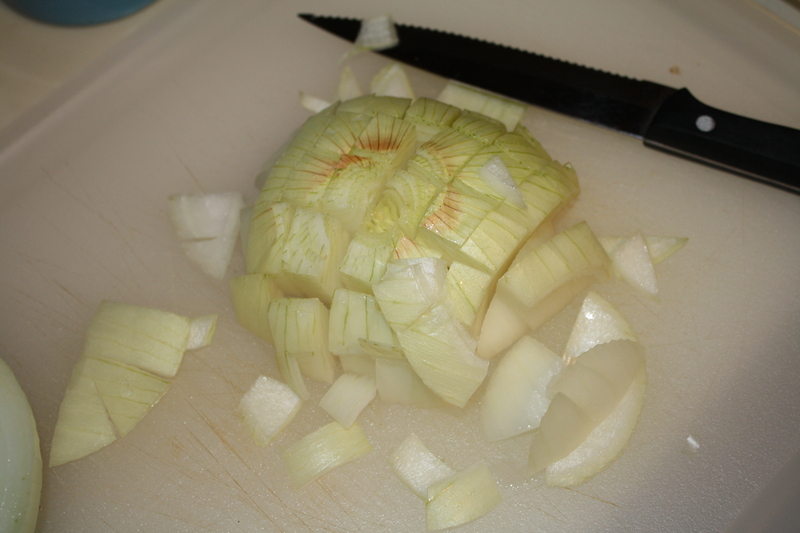 First, I coarsely chopped my onion. 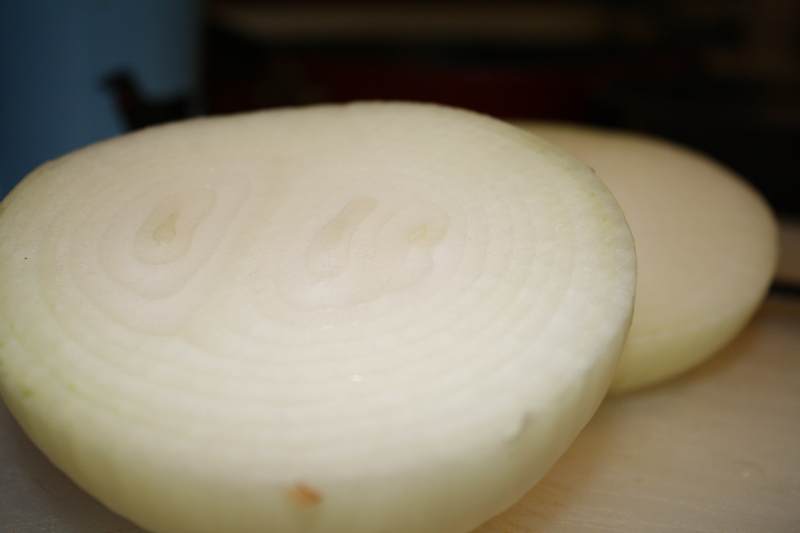 I ended up doubling this recipe, hence the copious amount of onion. 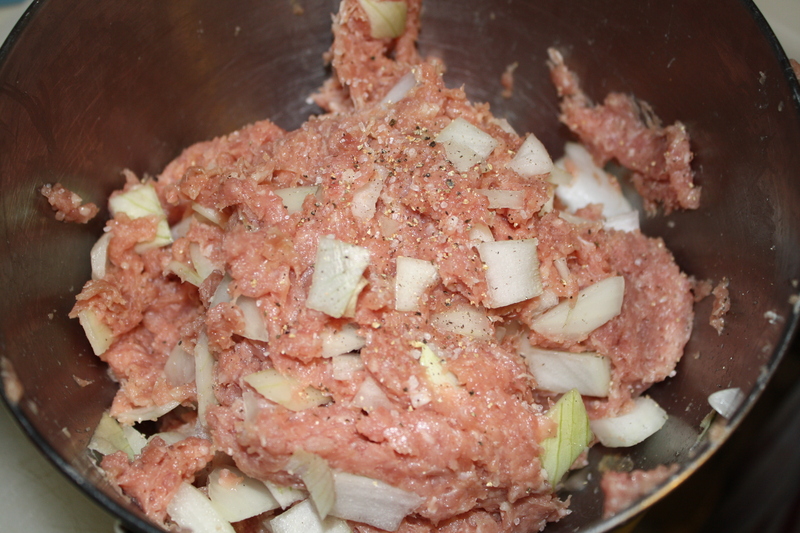 Then, I mixed the onion and the ground turkey. 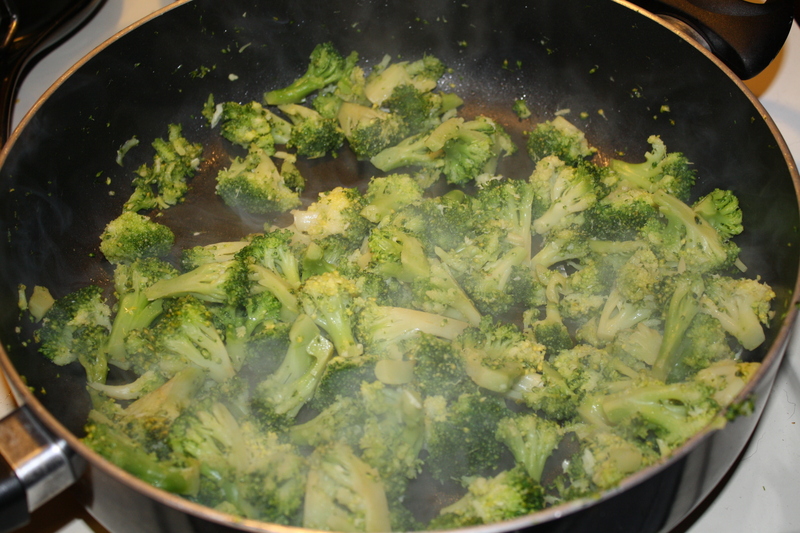 I added two cloves of crushed garlic, and salt and pepper. and secured the bacon with skewers. I covered the loaves and let them chill in the fridge for about 30 minutes. Once they had chilled, I put the meatloaves in the oven to bake at 400 F for 50 to 60 minutes. In order to crisp the bacon, I broiled the meatloaves for the last 5 minutes of their baking time. 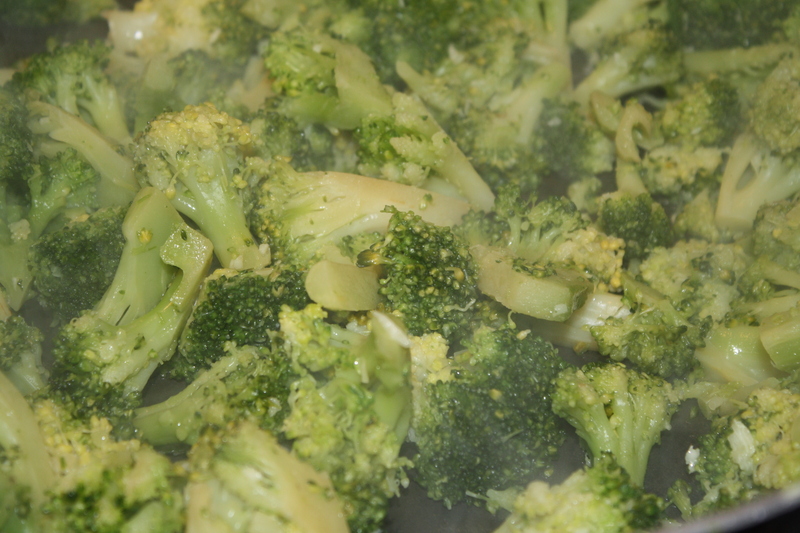 and served with broccoli sauteed with garlic in olive oil. 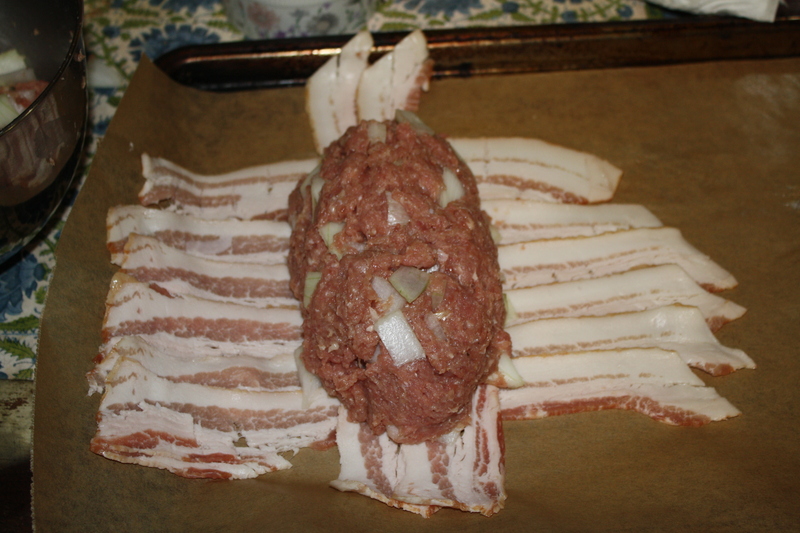 The bacon wrapped meatloaf was delicious! 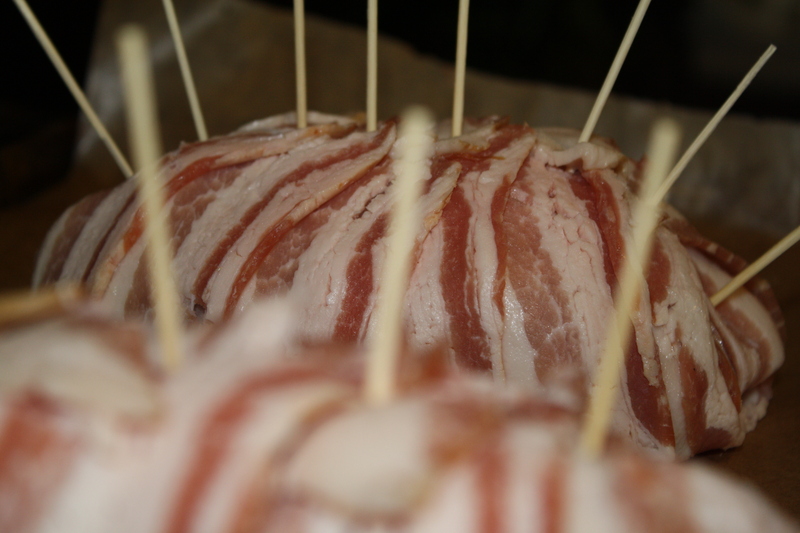 The bacon added just the right amount of pizazz to the plain ol’ turkey– it was a great centerpiece to a wonderful dinner. 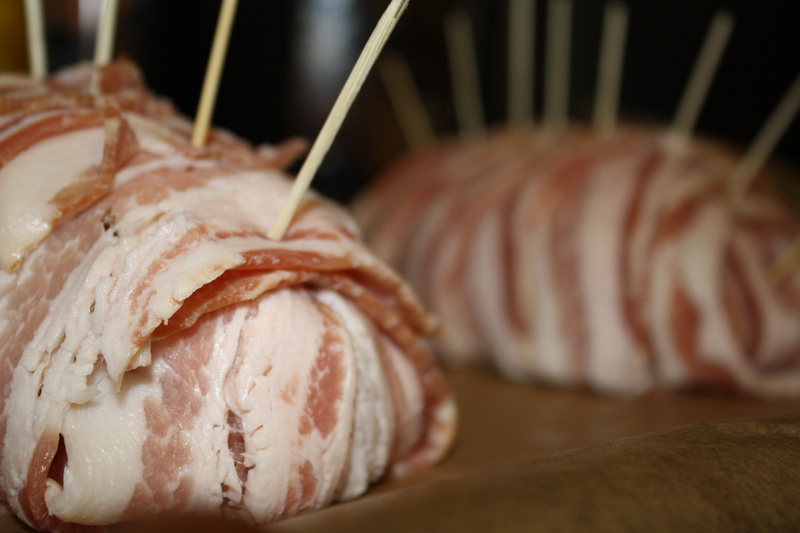 What have you wrapped in bacon lately? Allie, I will have to try this next time the family comes up for dinner!!! How yummy!! As you know, this family is CRAZY over bacon!! I just found your site and it is awesome. Doing the red peppers with some twists, as I type. But as a bacon fiend myself, I was wondering if you had tried broiled bacon wrapped bananas? It is a wonderful dessert…..with BACON! Broiled banana wrapped in bacon sounds amazing! Thanks so much for sharing… I’m so glad that you like the recipes! Thanks for stopping by! 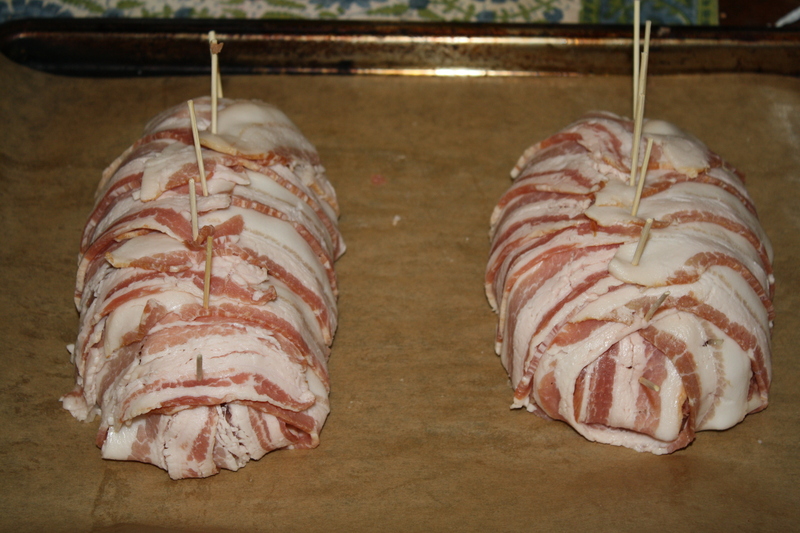 I just went through the pix again for the meatloaf…did you realize that they look like Lion Fish before cooking? Just a LOL for the day. HA! It took me like, 5 minutes to get this…but YES! They do look like Lion Fish! I just found your site the other day and love it! I made the meatloaf last night and it was wonderful! 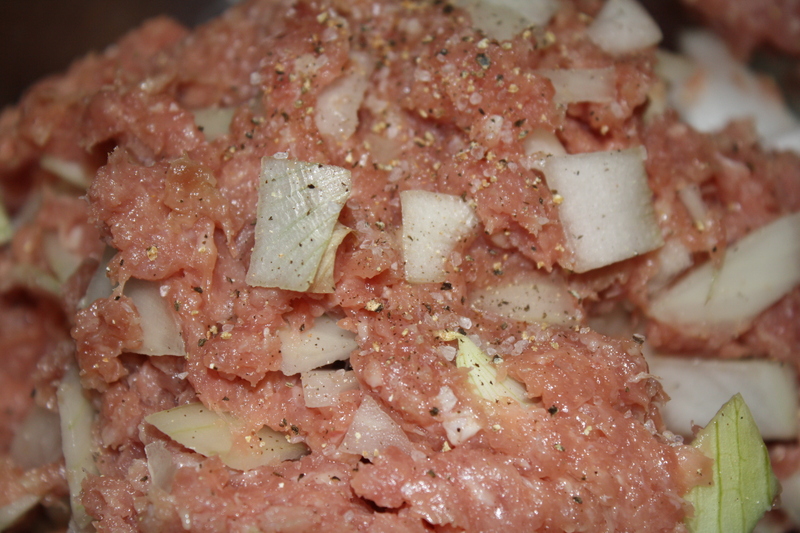 My son was not wild about meatloaf but after trying this recipe he went back for seconds! 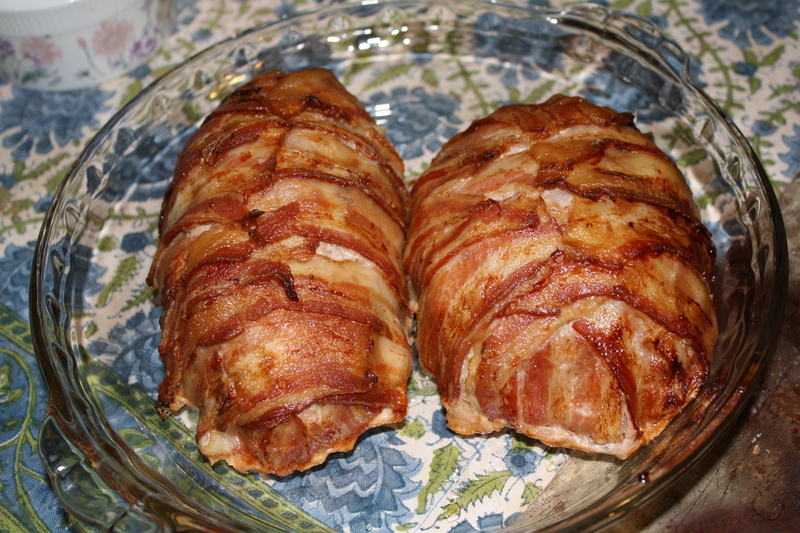 I have so many recipes marked down to try- especially this broiled banana wrapped in bacon this other mentioned before me. I may have to break down and do that tonight. I am reading through recipes and am developing a new-found resolve to eliminate processed foods from my family’s routine. Also, I’ve been on a 10-day cleanse and am just about ready to explode because I want a cookie, or a brownie, or a muffin or something. But I digress… About the bacon… any bacon? Is there a special type that’s “less processed” — or is all bacon pretty much the same? I’ve always lumped it in with sausage and processed lunch meats, but maybe I’m mistaken… Please enlighten me! Thanks. And can’t wait to try your cookie recipes! Hi Sheri! Yes, the best type of bacon is from pastured pork– you can usually find it at farmer’s markets, or online at US Wellness Meats (http://www.grasslandbeef.com/StoreFront.bok). 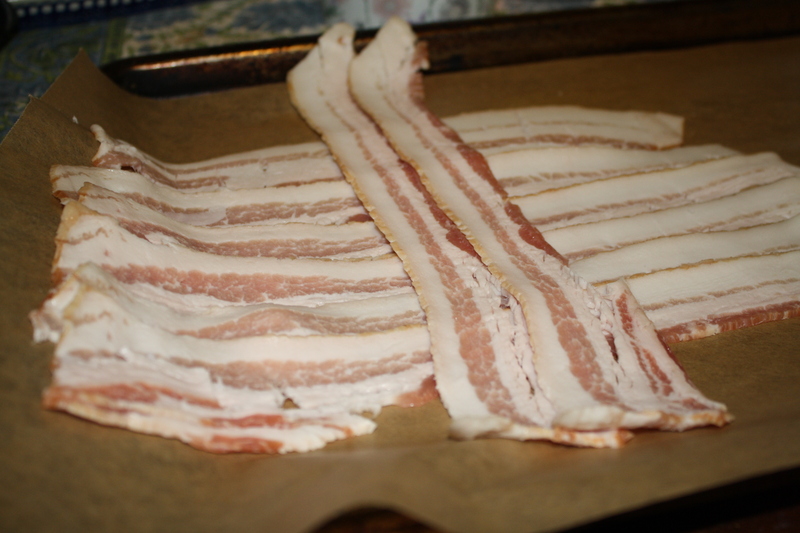 I can’t always buy pastured bacon, but I DO always buy the uncured bacon with no nitrates or nitrites added. You can find this type of bacon at every grocery store. I do the same for deli meats and sausage– I go for the natural, no nitrates or nitrites added kinds. I consider an every now and then food: I probably eat bacon once or twice a week, but not everyday. OK thanks! I’ve been buying the nitrate/ite free deli meat. Will look for the bacon too. 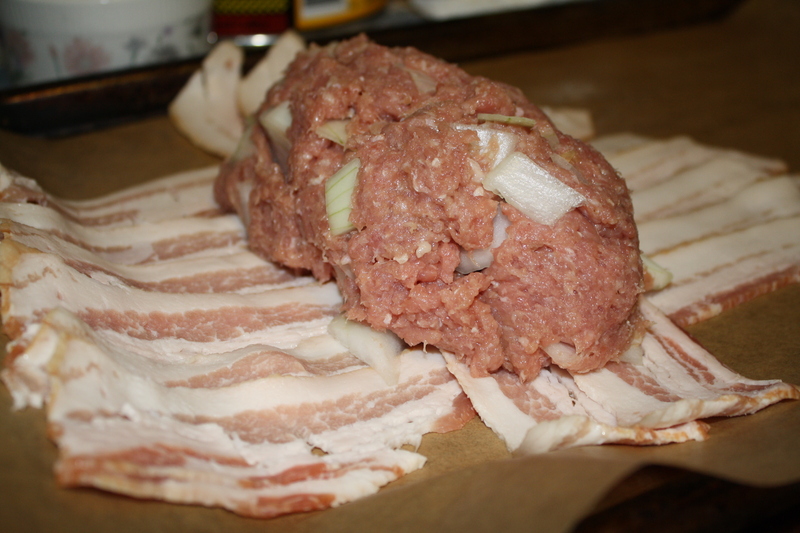 Great bacon wrapped meatloaf recipe. I love the idea of being simple, yet delicous!